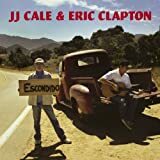 An album combining the talents of Eric Clapton and J. J.Cale has been overdue since Clapton recorded Cale's song "Cocaine" in 1977 on the album Slow Hand. Listening to this album, it seems as if the relationship picked right up where it left off. To say that this is a natural pairing would be an incredible understatement. It almost sounds like J. J. and Eric are living inside each other's heads. Starting with the cut "Danger," which sounds like it came out of the studio ', this is a solid 14 track disc that fans of both Clapton and Cale will enjoy immensely. "Missing Person" is a swanky, barroom blues rag, one of my favorite tracks on the disc, as is the smoky sultry "Sporting Life Blues." "Dead End Road" is a country/swing number complete with fiddle. "Three Little Girls" is a delicate soft composition. The whole disc just glides effortlessly back and forth between soft rock and southern blues. Most of the songs on the disc were penned by Cale, who has left his mark indelibly on Clapton's musical stylings over the years. Of course, Eric and J .J. did have a little help with this disc. In fact just counting musician,s there are over 20 credited on the sleeve, and not your average, everyday session players either. The late Billy Preston on the Hammond organ, Taj Mahal on some sweet harmonica riffs, and some extra help on the guitars by Doyle Bramhall II, John Mayer and Albert Lee. This is an all-star blues lineup. If I have only two complaints, my first is that this disc was just a little too well produced and clean. This disc almost needs some dirty scratchy pops and a little rougher/raspier/rawer edge. My other issue is that although the sleeve lists all the players, it doesn't tell you who played on which tracks, and with such an all-star cast that would be nice to know. But if those are my only complaints, they are insignificant in relation to the rest of the disc. Track list under the jump.